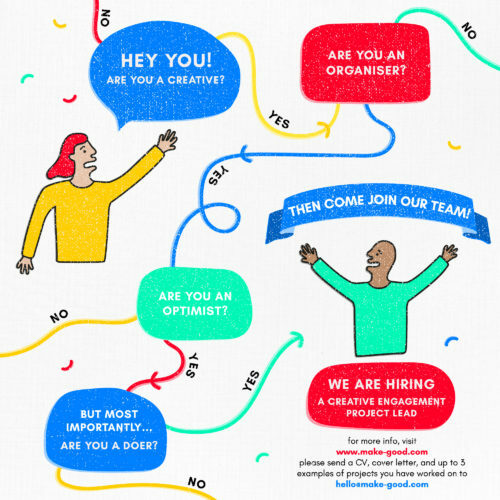 If you are a creative, an organiser, an optimist but most of all a doer then come and join our team! We are an architecture and design studio dedicated to building positive community participation in shaping local change. We believe in meaningful and inclusive processes of local co-design, bringing people together to collaborate on building the future of their public spaces/neighbourhoods. We use our creativity and design skills to make sure that everything we do is engaging for people who aren’t design experts and are always looking for the best way to gather insight from people and build relationships. We are looking for a Creative Engagement Project Lead who has experience in leading projects to join us to work on a range of community based projects in London. We are open to applications from people from all different industry backgrounds, you don’t have to have worked in the public or community sector before but it is important that you are interested in it and have an interest in the built environment. Our studio is based in Bermondsey, however this role will also involve being in project neighbourhoods across London and beyond every week as we believe in embedding ourselves in and around an area to really understand it. To apply please send a cover letter setting out your experience and interest in the role, a CV and up to 3 example projects you have worked on to catherine@make-good.com by 5pm on Wednesday 18th July.